It is unfortunate that on occasion an owner/occupier, committee member or resident manager will breach a body corporate By-Law. In Queensland, By-Laws are governed by the Body Corporate and Community Management Act 1997. This Act specifies that if a body corporate believes an owner / occupier is breaching the schemes by-laws they can issue a ‘by-law contravention notice’. This notice can be served as per Division 4 of the Act in two ways; either as a continuing contravention notice or a future contravention notice. A continuing contravention notice can be served if (a) a person (the person) who is the owner or occupier of a lot included in the scheme is contravening a provision of the by-laws for the scheme; and (b) the circumstances of the contravention make it likely that the contravention will continue. 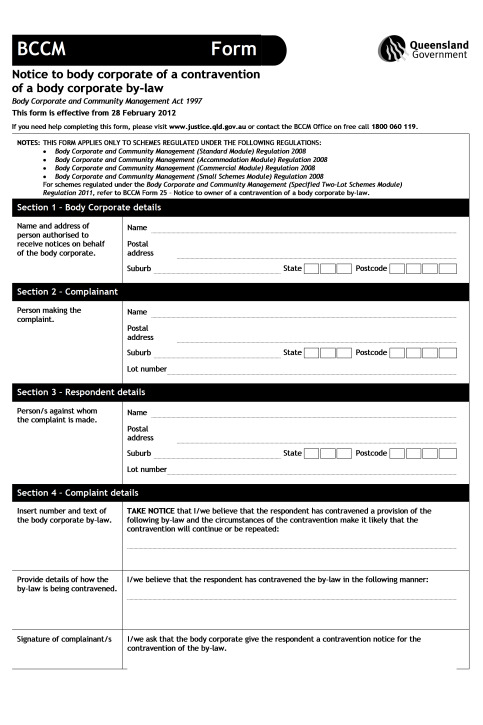 A future contravention notice can be served if (a) a person who is the owner or occupier of a lot included in a community titles scheme has contravened a provision of the by-laws for the scheme; and (b) the circumstances of the contravention make it likely that the contravention will be repeated. In both instances a contravention must occur, however the difference is highlighted in italics. If possible it is preferable to try and mediate early to avoid the contravention issue/s becoming more prevalent or damaging. If mediation is unsuccessful, you may consider discussing the issue with an experienced Solicitor. If you require further advice regarding by-laws, contact us at Alert Property Group.